On 29 May 2013, the Democratic Republic of the Congo (DRC) joined the SUN Movement with a letter of commitment from the Minister of Public Health. At the time, DRC had elaborated a Multi-Year Nutrition Plan (2009-2015) which had been revised in 2011 to align with the National Health Development Plan. The National Multi-Sectoral Nutrition Committee, created in December 2015, is not yet functional. However, the National Nutrition Programme’s technical platform – headed by the Ministry of Health – met eight times in 2016-2017, despite not having a dedicated budget. 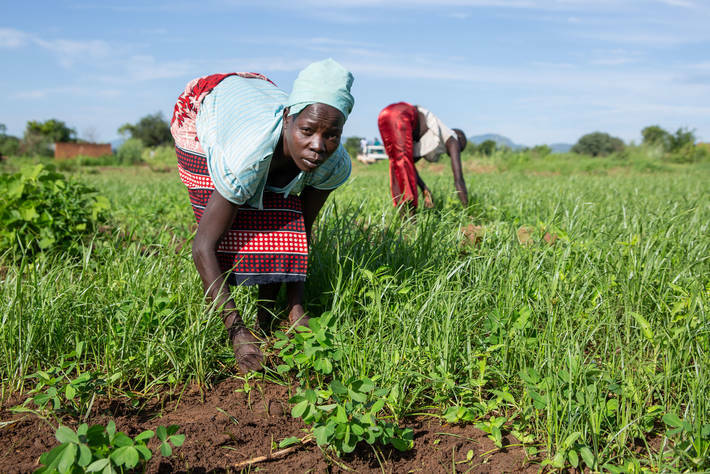 The multi-stakeholder platform (MSP) comprises all members of various nutrition and food security “clusters” and development stakeholders, as well as nutrition-related ministries, technical and financial partners, and United Nations agencies. The MSP members share data and information about emergencies and field activities. Four ministries are currently appointing nutrition focal points, which will bring the total number of ministries with nutrition resource persons to 10. These focal points will need to attend a multi-sectoral coordination training session. There are five formal networks, including a scientist network, and the civil society network is currently appointing a new steering committee as it seeks an injection of fresh impetus. Finally, some activities from the 2017 roadmap have been incorporated into the National Health Development Plan. In December 2015, a Prime Ministerial decree instituted the National multisectoral nutrition committee (CNMN), which includes an interministerial platform and a multi-player technical committee of experts. CNMN is not yet functional but regular technical meetings are held in the context of the Ministry of Health national nutrition programme. Furthermore, five networks have been formalized, including one for scientists, and these are drawing up roadmaps to increase their functionality. Finally, two multisectoral committees have been installed in the provinces of South Kivu and Kasai. The decree instituting the National Multisectoral Nutrition Committee (CNMN), as envisaged under the SUN Movement, is awaiting the Prime Minister’s signature. CNMN is expected to advise, take decisions, monitor and assess any questions on nutrition, under the authority of a focal point from the President’s Office. The CNMN comprises focal points from seven ministries, representatives of civil society, research, United Nations agencies and the Federation of Congolese Enterprises. An annual plan has been set out for 2015 under the term “roadmap” to guide the team in charge of the coordination of nutrition during the intervening period. Negotiations are under way to step up the private sector’s commitment, while the decentralisation of coordination structures in the provinces ad regions has been identified as a priority. Lastly, the platforms of the United Nations, donors and civil society have made their networks official at the central level, by setting out terms of reference and annual work plans, which have enabled them to become operational and to see the number of their members continue to swell. There are also networks of researchers and of members of parliament, but these are not official yet. The World Bank performed a multi-sectoral analysis of laws and policies in 2015, during the process of drafting the National Multi-Sectoral Strategic Plan. Health and agriculture strategy documents are currently being revised to make them more nutrition-sensitive, in line with the National Food Security and Nutrition Policy. Laws on the International Code of Marketing of Breast-milk Substitutes, food fortification and maternity leave also need to be revised. Insufficient progress has been made in establishing a coherent legal and policy framework because of the political situation in the country. Analysis of the existing policies and programmes relating to nutrition served as a basis for revision of the national nutrition policy, adopted in 2013 and broken down into a Strategic multisectoral nutrition plan (PNSMN), finalized in 2016. 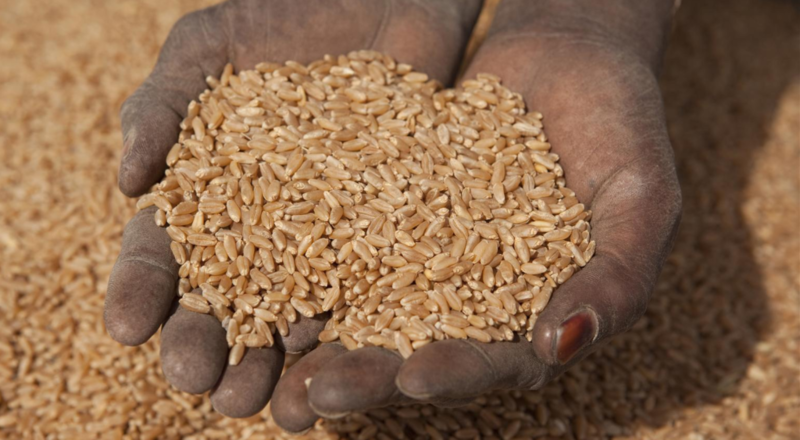 To date, nutrition has been integrated into strategic sectoral documents in the areas of agriculture, public health, poverty reduction and development. 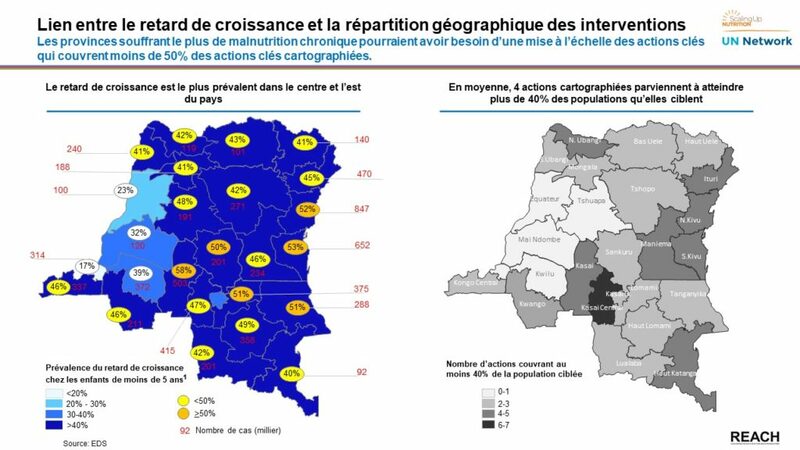 The Congo Federation of Enterprises is participating in efforts to improve legislation on the fortification of foods. National legislation and policy on nutrition includes a national strategy on feeding infants and young children, a protocol on the comprehensive management of acute malnutrition, a code of marketing breastmilk substitutes and a strategic plan for food fortification. A communication plan on community-based nutrition is currently at drafting phase. A study of existing policies made it possible to review and develop, in a participatory manner, a new national multisectoral nutrition policy in October 2013. To date, nutrition is being incorporated into the strategic policies and plans of 11 ministries (including: education, gender, social protection, agriculture and rural development) which are harmonised with the national nutrition policy, with support from partners. 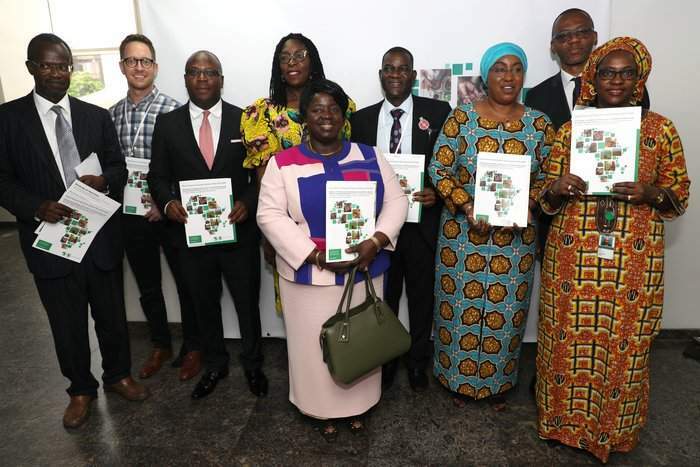 Stakeholders now refer to the National Multi-Sectoral Strategic Plan for Nutrition (PNSMN) and the associated operational plan (which include a common results framework) to select the majority of activities for inclusion in their annual workplans. Government programmes are currently being revised to make them nutrition-sensitive, but the Government has yet to start implementing the PNSMN and the associated action plan, because no dedicated resources have been allocated. 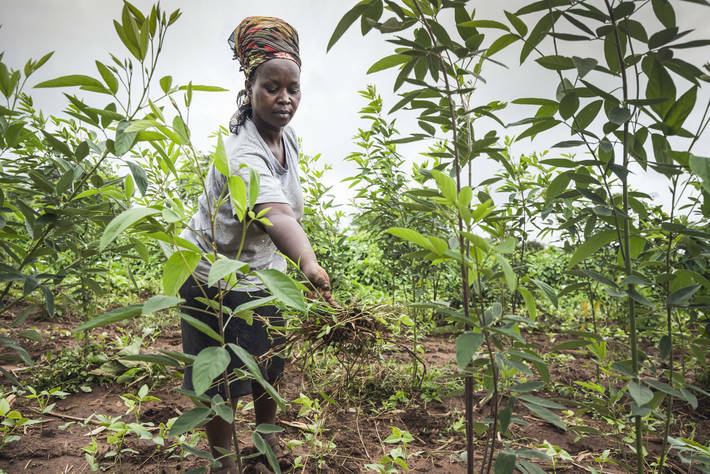 Technical and financial partners are implementing a handful of activities using their own funds. The preliminary nutrition and food security stakeholder map also needs to be finalised. PNSMN is broken down into an operational plan with its own monitoring and evaluation team. The latter defines the strategic priorities, objectives, anticipated results, indicators and targets for action. However, the definitions of the roles and contributions of each actor have not yet been finalised. An action plan has been created at a central level to be implemented in 2016, which it will be the task of the provinces to implement. There are still challenges: for example implementing these plans, given the absence of sufficient financing, and installing an information system that is able to operationalize the monitoring and evaluation team. The National Strategic Multisectoral Nutrition Plan (PNSMN) will serve as the foundation for establishing a common results framework and a document has been drawn up specifying the stages of its development. To lay the foundations of this document, a study has been conducted by the government with support from the World Bank, on the order of priority and estimated cost effectiveness for applying large-scale nutrition actions. Once it had been finalised in September 2014, it brought to light five possible scenarios which should be discussed at the highest level of the state. Once the PNSMN has been drawn up, it is planned to allocate a budget and convert it into an operational implementation plan which will act as a common results framework and a reference for future provincial plans. However, gaps in financing have delayed the planned schedule. The estimated costings for PNSMN activities, by the World Bank and UNICEF, are included in the action plan but the Government has not set aside a dedicated budget for their implementation. Funding needs are therefore known, but plans for a high-level donor roundtable event were abandoned because of a lack of funds. The SUN Movement in the Democratic Republic of the Congo has had an allocated budget since 2015, but the funding has not materialised and there is still no long-term resource mobilisation strategy. Movement in the 2015 and 2016 state budgets, but the disbursements have not taken place. The current investments of the government and its partners are insufficient, which highlights the need to redouble efforts to mobilize resources. Budgetary allocations by the state have been monitored over the past three years (2012, 2013 and 2014). Some ministries (health and education) have already freed up specific budget lines, but an additional budget line of one billion Congolese Francs was registered for the first time in the 2015 state budget. This will be used to continue to develop the PNSMN, the common results framework, the plan of investment in nutrition and provincial operational plans; set up intersectoral nutrition committees in the provinces; raise more funding; and support coordination, follow-up and evaluation. 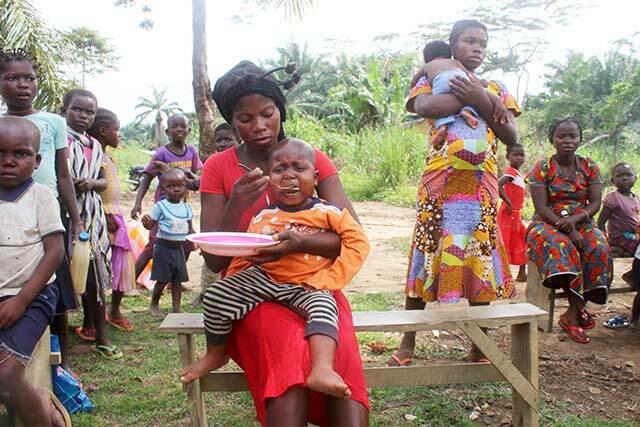 The Democratic Republic of the Congo hopes that once the PNSMN and the common results framework are in place, the budget line for nutrition can be increased.